Evolution is the name of the game these days, even for the so-called fixed signs (Taurus, Leo, Scorpio and Aquarius) -- and life is about to heat up in a big way as we move into spring. In fact, if you're an Aquarius (or someone you love is), you should know that two eclipses in 2014 will be aspecting your chart directly, potentially moving you further along your path faster than usual. 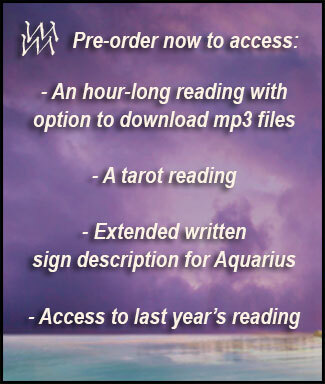 That makes now the best time to purchase the 2014 Aquarius birthday reading by Eric Francis. It's the perfect 'just because' gift for yourself or a friend -- and you can pre-order now for a deeply discounted rate: just $19.95. Eric is about to record this in-depth reading, which covers the most important themes of your astrology for the next four seasons (his intensive work on The Mars Effect threw his schedule off a bit). Note that this reading will be significantly different from the Mars Effect reading for Aquarius, containing new information offered with a new approach. And Eric's birthday readings are just as accessible and on-point for those with Aquarius rising or Moon -- so don't be fooled by the word “birthday” in the title! One listener recently told Eric that her reading "couldn't have been more accurate had I whispered it in your ear myself." Another wrote: "AMAZING, AMAZING, AMAZING, SO RIGHT ON!!!!!!!! Just what I needed to hear as times they are a changing!!" You won't find another audio reading on the Internet that comes so close to a personal reading for a fraction of the cost. And Eric dives into the implications of astrological events, including eclipses, in clear, easy-to-understand language that speaks to what matters most to you: your relationships; career and creativity; spiritual healing; and the ability to move through challenges and embrace opportunities. Eric uses the Voyager Tarot by James Wanless for the tarot portion of your reading -- and it always gets rave reviews. One listener described the tarot portion as "absolutely mind blowing and beautiful." I have a feeling you will, too. Once Eric publishes the Aquarius birthday reading, the price will increase -- so pre-order now for the best price. PS -- The birthday reading for Pisces will be available soon too. You may pre-order that reading for yourself or your favorite fish here.